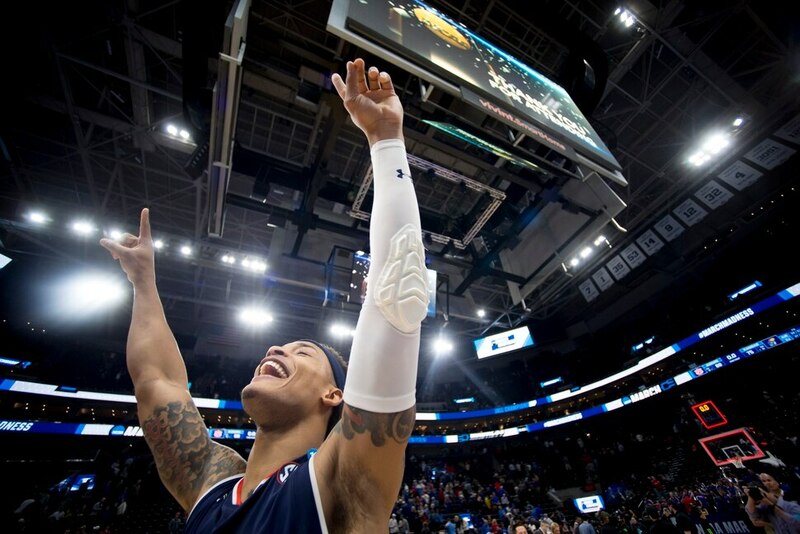 (Leah Hogsten | The Salt Lake Tribune) Auburn Tigers guard Bryce Brown (2) celebrates after his team beat Kansas in the second round of the NCAA tournament in Salt Lake City on Saturday, March 23, 2019. (Leah Hogsten | The Salt Lake Tribune) Auburn Tigers guard Bryce Brown (2) drives to the basket as Auburn faces Kansas in the second round of the NCAA tournament in Salt Lake City on Saturday, March 23, 2019. 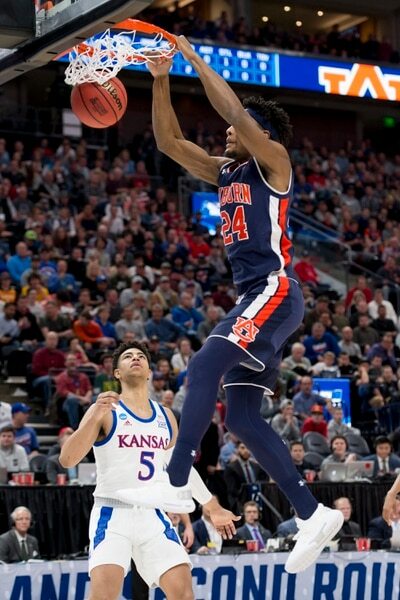 (Leah Hogsten | The Salt Lake Tribune) Auburn Tigers forward Anfernee McLemore (24) dunks over Kansas Jayhawks guard Quentin Grimes (5) as Auburn faces Kansas in the second round of the NCAA tournament in Salt Lake City on Saturday, March 23, 2019. (Leah Hogsten | The Salt Lake Tribune) Auburn Tigers guard Malik Dunbar (4) shoots past Kansas Jayhawks forward Dedric Lawson (1) as Auburn faces Kansas in the second round of the NCAA tournament in Salt Lake City on Saturday, March 23, 2019. (Leah Hogsten | The Salt Lake Tribune) Auburn Tigers guard Jared Harper (1) gets double teamed by Kansas Jayhawks forward Dedric Lawson (1) and Kansas Jayhawks guard Quentin Grimes (5) as Auburn faces Kansas in the second round of the NCAA tournament in Salt Lake City on Saturday, March 23, 2019. (Leah Hogsten | The Salt Lake Tribune) Kansas Jayhawks head coach Bill Self reacts as Auburn faces Kansas in the second round of the NCAA tournament in Salt Lake City on Saturday, March 23, 2019. (Leah Hogsten | The Salt Lake Tribune) Auburn Tigers guard Bryce Brown (2) looks for his missing shoe as Auburn faces Kansas in the second round of the NCAA tournament in Salt Lake City on Saturday, March 23, 2019. (Leah Hogsten | The Salt Lake Tribune) Kansas Jayhawks guard Ochai Agbaji (30) pressures Auburn Tigers guard J'Von McCormick (12) as Auburn faces Kansas in the second round of the NCAA tournament in Salt Lake City on Saturday, March 23, 2019. (Leah Hogsten | The Salt Lake Tribune) Auburn Tigers guard Jared Harper (1) drives to the basket as Auburn faces Kansas in the second round of the NCAA tournament in Salt Lake City on Saturday, March 23, 2019. (Leah Hogsten | The Salt Lake Tribune) Auburn Tigers guard Jared Harper (1) gets tangled up with Kansas Jayhawks guard Quentin Grimes (5) as Auburn faces Kansas in the second round of the NCAA tournament in Salt Lake City on Saturday, March 23, 2019. (Leah Hogsten | The Salt Lake Tribune) The Auburn band heckles Kansas Jayhawks guard Devon Dotson (11) as Auburn faces Kansas in the second round of the NCAA tournament in Salt Lake City on Saturday, March 23, 2019. (Leah Hogsten | The Salt Lake Tribune) Auburn Tigers guard Jared Harper (1) tries to keep the ball away from Kansas Jayhawks forward David McCormack (33) and Kansas Jayhawks guard Charlie Moore (2) as Auburn faces Kansas in the second round of the NCAA tournament in Salt Lake City on Saturday, March 23, 2019. (Leah Hogsten | The Salt Lake Tribune) Auburn Tigers forward Chuma Okeke (5) gets blocked by Kansas Jayhawks guard K.J. Lawson (13) as Auburn faces Kansas in the second round of the NCAA tournament in Salt Lake City on Saturday, March 23, 2019. (Leah Hogsten | The Salt Lake Tribune) Auburn Tigers forward Horace Spencer (0) shoots over Kansas Jayhawks forward Mitch Lightfoot (44) as Auburn faces Kansas in the second round of the NCAA tournament in Salt Lake City on Saturday, March 23, 2019. (Leah Hogsten | The Salt Lake Tribune) Auburn Tigers forward Horace Spencer (0) knocks over Kansas Jayhawks guard Devon Dotson (11) as Auburn faces Kansas in the second round of the NCAA tournament in Salt Lake City on Saturday, March 23, 2019. (Leah Hogsten | The Salt Lake Tribune) Kansas Jayhawks guard Quentin Grimes (5) shoots over Auburn Tigers forward Horace Spencer (0) as Auburn faces Kansas in the second round of the NCAA tournament in Salt Lake City on Saturday, March 23, 2019. (Leah Hogsten | The Salt Lake Tribune) Kansas Jayhawks guard Ochai Agbaji (30) drives to the basket under pressure from Auburn Tigers forward Anfernee McLemore (24) as Auburn faces Kansas in the second round of the NCAA tournament in Salt Lake City on Saturday, March 23, 2019. (Leah Hogsten | The Salt Lake Tribune) Kansas Jayhawks forward David McCormack (33) tries to get to the basket under pressure from Auburn Tigers forward Horace Spencer (0) and Auburn Tigers forward Chuma Okeke (5) as Auburn faces Kansas in the second round of the NCAA tournament in Salt Lake City on Saturday, March 23, 2019. (Leah Hogsten | The Salt Lake Tribune) Auburn Tigers center Austin Wiley (50) celebrates with his team as Auburn faces Kansas in the second round of the NCAA tournament in Salt Lake City on Saturday, March 23, 2019. (Leah Hogsten | The Salt Lake Tribune) Auburn Tigers forward Horace Spencer (0) blocks Kansas Jayhawks forward David McCormack (33) as Auburn faces Kansas in the second round of the NCAA tournament in Salt Lake City on Saturday, March 23, 2019. (Leah Hogsten | The Salt Lake Tribune) Kansas Jayhawks guard Devon Dotson (11) breaks away from Auburn in the second round of the NCAA tournament in Salt Lake City on Saturday, March 23, 2019. (Leah Hogsten | The Salt Lake Tribune) Auburn Tigers guard Bryce Brown (2) celebrates a three pointer as Auburn faces Kansas in the second round of the NCAA tournament in Salt Lake City on Saturday, March 23, 2019. (Leah Hogsten | The Salt Lake Tribune) Kansas Jayhawks guard Devon Dotson (11) drives to the basket under pressure from Auburn Tigers forward Chuma Okeke (5) as Auburn faces Kansas in the second round of the NCAA tournament in Salt Lake City on Saturday, March 23, 2019. (Leah Hogsten | The Salt Lake Tribune) Auburn and Kansas players scramble for the ball as they face off in the second round of the NCAA tournament in Salt Lake City on Saturday, March 23, 2019. (Leah Hogsten | The Salt Lake Tribune) Kansas Jayhawks guard Quentin Grimes (5) looks to get rid of the ball under pressure from Auburn Tigers center Austin Wiley (50) as Auburn faces Kansas in the second round of the NCAA tournament in Salt Lake City on Saturday, March 23, 2019. (Leah Hogsten | The Salt Lake Tribune) Kansas Jayhawks guard Marcus Garrett (0) tries to drive past Auburn Tigers guard Jared Harper (1) and Auburn Tigers guard J'Von McCormick (12) as Auburn faces Kansas in the second round of the NCAA tournament in Salt Lake City on Saturday, March 23, 2019. (Leah Hogsten | The Salt Lake Tribune) Auburn Tigers head coach Bruce Pearl reacts as Auburn faces Kansas in the second round of the NCAA tournament in Salt Lake City on Saturday, March 23, 2019. (Leah Hogsten | The Salt Lake Tribune) The Kansas bench reacts as they lose to Auburn in the second round of the NCAA tournament in Salt Lake City on Saturday, March 23, 2019. (Leah Hogsten | The Salt Lake Tribune) Auburn Tigers head coach Bruce Pearl wipes his brow after his team beat Kansas in the second round of the NCAA tournament in Salt Lake City on Saturday, March 23, 2019. (Leah Hogsten | The Salt Lake Tribune) Auburn Tigers head coach Bruce Pearl celebrates with fans after his team beat Kansas in the second round of the NCAA tournament in Salt Lake City on Saturday, March 23, 2019. (Leah Hogsten | The Salt Lake Tribune) Auburn Tigers guard Bryce Brown (2) and Auburn Tigers guard Jared Harper (1) sign autographs for fans after they beat Kansas in the second round of the NCAA tournament in Salt Lake City on Saturday, March 23, 2019. (Leah Hogsten | The Salt Lake Tribune) Auburn Tigers head coach Bruce Pearl celebrates after his team beat as Kansas in the second round of the NCAA tournament in Salt Lake City on Saturday, March 23, 2019. Their motto from the outset has been “unfinished business.” This group of veterans have remained on task all season. It continued Saturday night inside Vivint Smart Home Arena. And yes, there’s still plenty of work to be done. The No. 5-seeded Auburn Tigers blitzed the No. 4 Kansas Jayhawks from the opening whistle and never relented in the 89-75 victory. The win was Auburn’s ninth consecutive during this streak and 11th out of its last 12 outings. The Tigers, fresh off their serious first-round scare against No. 12 New Mexico State Thursday, showed zero signs of a hangover in round two. No, the SEC tournament champions took it to Bill Self’s inexperienced group, got back playing its prototypical break-neck style that spurred the Tigers to a conference title. It was Bryce Brown, who had a game-high 25 points on seven made 3-pointers, comfortably splashing 3’s whenever and wherever he found space. It was Jared Harper, who had 18 points and six assists, knifing through the Jayhawk defense. It was Chuma Okeke (12 points, five rebounds, four assists, four steals) making pretty much everything look easy. It was one of the best defensive teams in the country just putting the clamps down on a team filled with McDonald’s All-Americans. It was the kind of clinic sometimes seen in March: a grizzled batch who’ve been there, who don’t want their careers to come close to an end, against the youngsters who’ve yet to come across a group this determined this late in the season. Above all, it was perhaps a reminder to the rest of this side of the bracket that when Auburn is on, when these Tigers are playing free, and loose of any fear of a first-round upset or disheartening second-round exit, they can hang with anyone in college basketball. “We get out in transition, knock down shots, and I feel like that’s just part of who we are and what we do,” Brown said. A 15-5 start, punctuated by several wide-open 3-pointers, ballooned from there. 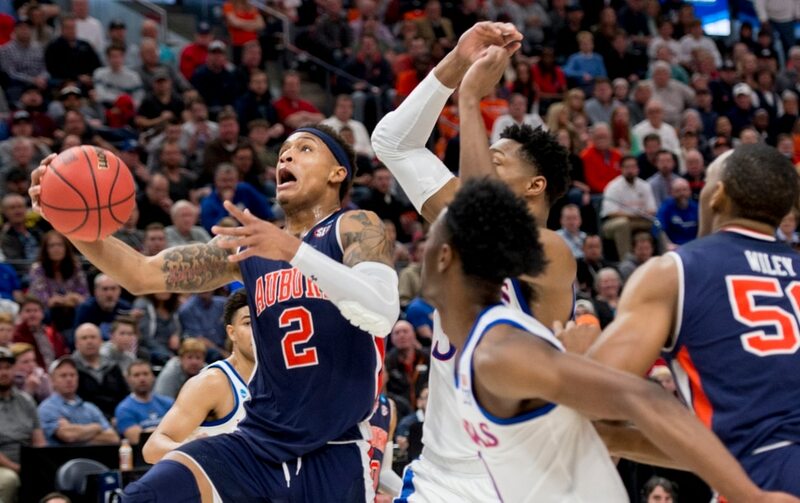 Soon, the Tigers found themselves up by as much as 20 with the Jayhawks flummoxed offensively and left hopefully trying to stay in front of the Auburn players who were a step quicker. Auburn didn’t let up. The Tigers were up by 26 at halftime, having drained nine 3-pointers and turned the ball over just twice. It was Kansas’ largest NCAA Tournament halftime deficit ever. Pearl’s motivational tactics throughout the week worked. On Friday, Okeke said he felt like everyone on this Tigers team is undervalued or overlooked. Maybe by some in some circles of the SEC, but no longer. Not when you whoop a team like Kansas like that with a trip to the Sweet 16 on the line. "The better team won today," Pearl said. Now Auburn heads a little closer to home, to Kansas City, spoiling what would’ve been a Jayhawk frenzy. And the Tigers get the winner of No. 1 North Carolina and No. 9 Washington in the Midwest region. It’s the first time Auburn has made the Sweet 16 since 2003.